We care deeply about what we do, so we're constantly working hard to make our services even better for you our customers. We have made some changes to our client portal which we think you're going to love. Please take a moment to login and take a look at our new client portal system changes offering huge usability enhancements that will make many common tasks much easier and accessible. 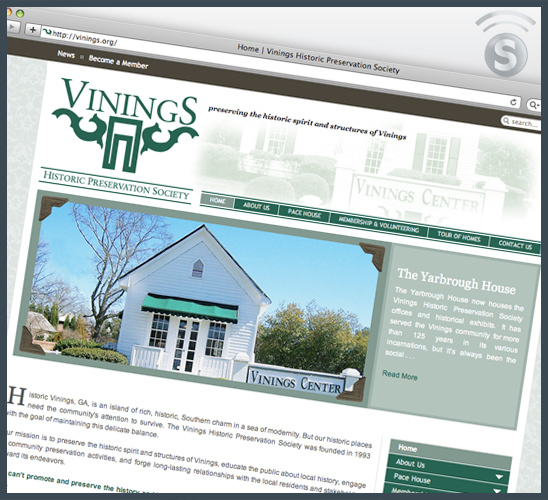 Simple Source Solutions is proud to present www.vinings.org, a new website for the Vinings Historic Preservation Society in Vinings, Georgia. The VHPS needed a new website to not only beautifully represent Historic Vinings, but moreover it needed to function as a resource to the valuable members and community events, such as the Vinings Tour of Homes, that support their efforts. So, amongst all the sophistication, you're sure to notice image slideshows, event registration, online membership sign-up and renewals, secure pages for transactions, and fresh new copy to accompany their expanded brand. There's plenty going on behind the scenes on their site. For much of the site's functionality we have made good use of the powerful component civiCRM. Now the VHPS has more available to it's organization than mere credit card transactions. They have a whole suite of tools at their disposal, sending out membership renewal reminders, managing member info, sending out event information, and plenty more supporting their efforts. The VHPS stays pretty busy with their mission and efforts–leaving little time to fool around with a website. So, when it comes time for site updates, they've chosen to utilize our time and expertise in keeping their site up to date with both our Content Concierge and Addon Maintenance Services. Our website maintenance services help keep many of our customers' sites current. If you haven't seen what Historic Vinings has to offer, please do check out the VHPS. They have been a pleasure to design for and we look forward to supporting them well into the future. It has been noted that there are a few important changes to Joomla! that come with the 1.5.15 update that should be noted. They made some changes to the .htaccess file (htaccess.txt in the upgrade package) that deny access to all xml files on your directory. This is great as it disallows access to your xml files so that hackers can't use them to see your extension version info. The only problem with this is if you want any of your xml files to be publicly accessible (xml feeds, google xml feed for webmaster tools, etc. ), you will need to put exceptions for those individual files in your .htaccess file . . . which honestly is a pain if you have several xml files you want to be viewable. OR, if you are one of our Joomla! hosting customers, your xml files are already protected by our server configuration. So, thank you Joomla! for realizing and offering a fix for this for those whose sites are not on a Joomla! optimized host. Not having to worry about this is yet another benefit of hosting with Simple Source Solutions.